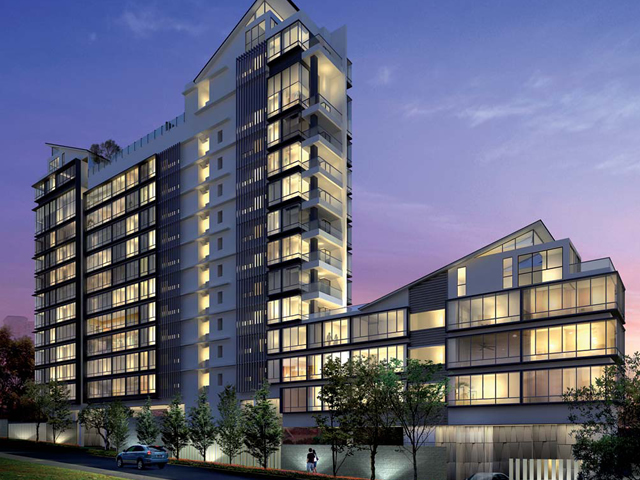 Caspian is a 99 years leasehold development located at 50 Lakeside Drive, Singapore 648315, in district 22. It is expected to be completed in 2013 by Frasers Centrepoint Limited. 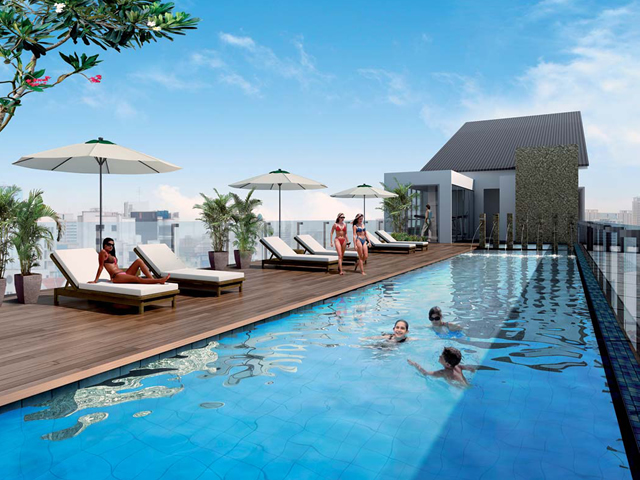 This 17 storey condominium will have a total of 712 lavishly spacious units comprising of 1 bedroom, 2 bedrooms, 2 bedrooms + study, 3 bedrooms, 4 bedrooms and penthouses. Each unit allows you to enjoy natural lighting and ventilation and has the best finishes and fittings in place especially for you. Step into Caspian and you will be greeted by a stunning waterfall, lush greenery and an elegant pool. Here you can enjoy a brand new lakeside living in this resort styled development. Experience a vibrant lifestyle here at the Caspian with many of its fabulous facilities available in house. There is a fabulous holistic selection of facilities for you to recharge, rejuvenate and refresh you mind, body and soul. Here you can ease away the tiredness accumulated, immerse you mind and body in complete relaxation and seek inner serenity right in the comfort of home grounds. You can have a game of tennis, work out in the gym, have a leisure swim, bring your kids to the playground or fun pool and also have a BBQ session. There is also a car park and 24 hours security here. The range of in house facilities will pamper you to the max. In a class of its own, Caspian, it is favorably located within the proximity of major roads and public transport. It is located at 50 Lakeside Drive Singapore 648315, in District 22. The nearest Mrt stations is Lakeside Station which is 0.18km away. Other nearby Mrt stations are Jurong East and Chinese Garden stations. There are several bus services available here. Driving to Central Business District and Orchard Shopping District will only take you about under 20 minutes. Major expressways like AYE and PIE are seamlessly and conveniently connected to every part of Singapore making it so hassle free for you to travel to work or play. For daily necessities such as retail shops, supermarkets or banks, you can head down to the nearby Boon Lay Shopping Center, IMM, Taman Jurong Neighborhood Shopping Center, Jurong Point, Jcube, Jurong East Market and Food Centre and Jurong Entertainment Centre. For more dining options, head down to Boon Lay Central and Jurong East Central. Nearby supermarkets include NTUC Faiprice supermarket at Boon Lay Shopping Complex and Sheng Siong Supermaket at 544 Jurong West Street 42 . Other nearby recreational facilities includes Singapore Science Center, Singapore Discovery Center, Chinese and Japanese Gardens, Snow Center, Superbowl Jurong, Fairway Club of Palm Resort, Jurong Country Club and Jurong Golf Course. There are few reputable local and international schools in the vicinity; these include Rulang Primary School, Shuqun Primary School, Yuan Ching Secondary School, Eden School, Boon Lay Secondary School, The Japanese School, River Valley High School, Canadian International School, Jurong Junior College and Nanyang Technological University. For medical care, residents can head down to nearby general practitioners, Westpoint Family Hospital, Jurong Medical Centre and the upcoming Jurong General Hospital. Caspian offers the best of Singapore’s Jurong area.It is a prestigious home of timeless appeal for the privileged few where you can luxuriate in the lyrical moments of life. It is an ideal place to live in with many amenities in the neighborhood. Here, you can find equilibrium and tranquility after a long day at work and get fully recharged for new challenges ahead.